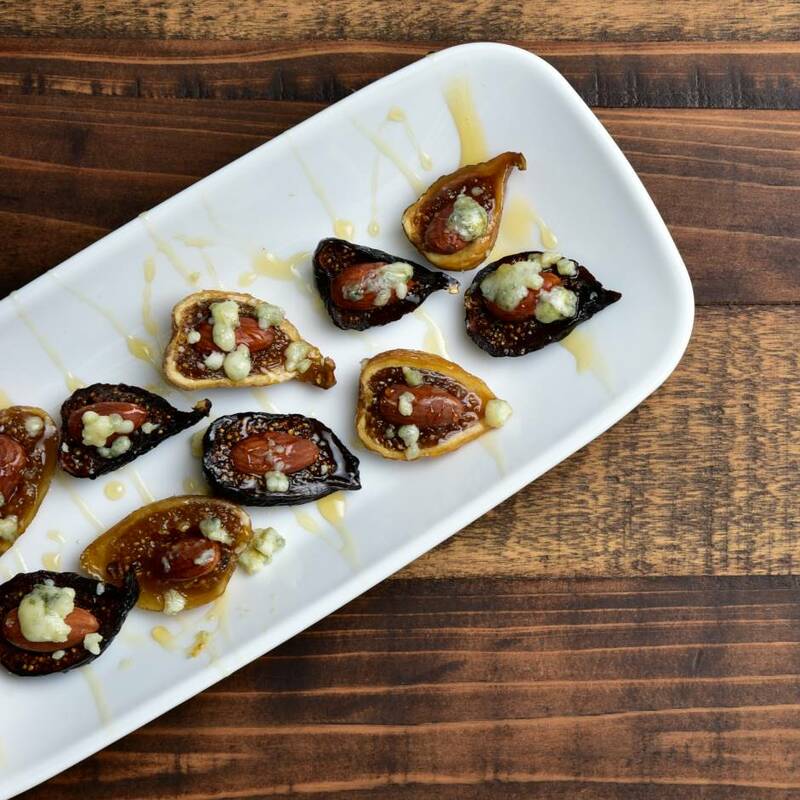 Dried dates are cut in half, spread with blue cheese, and topped with almonds. 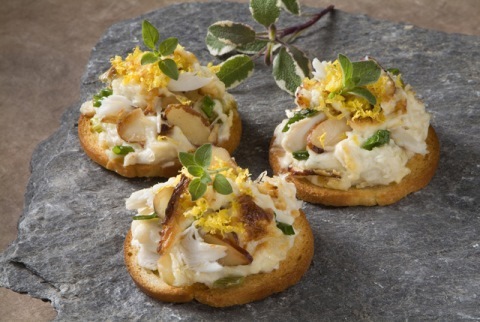 Delicious one-bite appetizers. In a small bowl, mix the cheese until creamy with a hand mixer. You may need to add a few drops of milk if the cheese is crumbly. Set aside. Place the dates on a serving platter. Using a knife, spread about 1 teaspoon of cheese on the cut side of each date. Top with 1 almond. 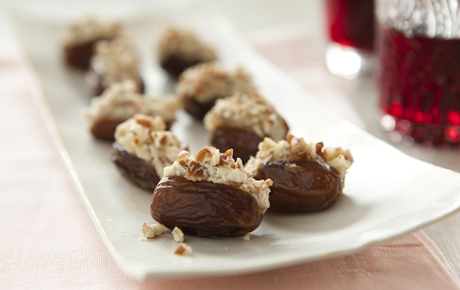 Sprinkle the stuffed dates with a dash of cayenne pepper and serve. In a medium bowl, mix ground Cashews and bread crumbs. Stir in olive oil, tomato paste and hot sauce. Add minced onion and parsley. Mix well. 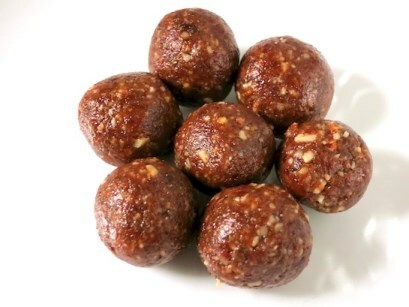 Using your hands, form the mixture into small bite-size balls. Refrigerate until ready to use. Yield: 4 servings. Preheat oven to 350°. Coat a 9” x 13’’ baking dish with cooking spray. Combine cereal, pretzels and nuts in baking dish. In a small bowl, combine butter and honey. Pour over cereal mixture, tossing lightly to coat evenly. Bake, stirring frequently, until crispy and caramelized (45-50 min.). Cool. Makes 2 1/2 quarts. Store tightly covered. In ungreased 1 1/2-quart casserole or 9-inch glass pie plate, mix cream cheese, onions, garlic, Parmesan cheese, mayonnaise, wine, hot pepper sauce and mustard. Stir in crab meat. Sprinkle with almonds. Bake uncovered 15 to 20 minutes or until hot and bubbly. In a large bowl, combine the bacon, cream cheese, Cheddar cheese and salad dressing. Mix together well and form into a ball. 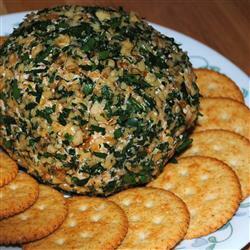 In a shallow dish, mix together the parsley and chopped walnuts. Roll cheese ball in mixture to coat. Refrigerate until chilled. Heat oven to 375°. Grease a 9 x 9 x 2" pan. Mix the broccoli, corn, onion and walnuts. Place in the pan. Beat the remaining ingredients except for the cheese until smooth, stopping frequently to scrape down the sides of the mixer if necessary. Pour evenly into the pan on top of the vegetable mixture. Bake until a knife inserted into the center comes out clean, about 23-25 minutes. Sprinkle with the cheese. Bake until the cheese is melted, 2-3 minutes longer. Cool for 30 minutes, then cut into triangles or squares. Heat oven to 350°. Wrap 1/2 slice of bacon around an apricot half, secure with a toothpick. Place on ungreased cookie sheet and bake 20-25 minutes or until the bacon is brown & crisp. Turn once during baking. While the bacon is cooking mix the jam & soy sauce in a saucepan and cook over low heat until the jam has melted and mixed with the soy sauce. Remove bacon/apricots from oven and place on paper towels to remove excess grease. 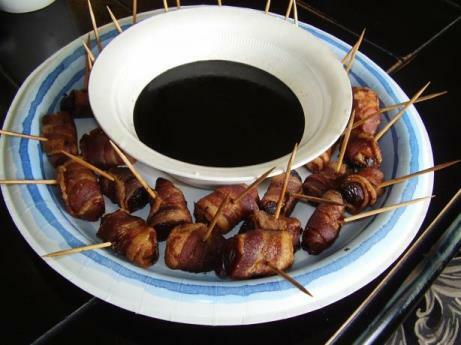 Serve dipping sauce with the bacon-apricot appetizers.